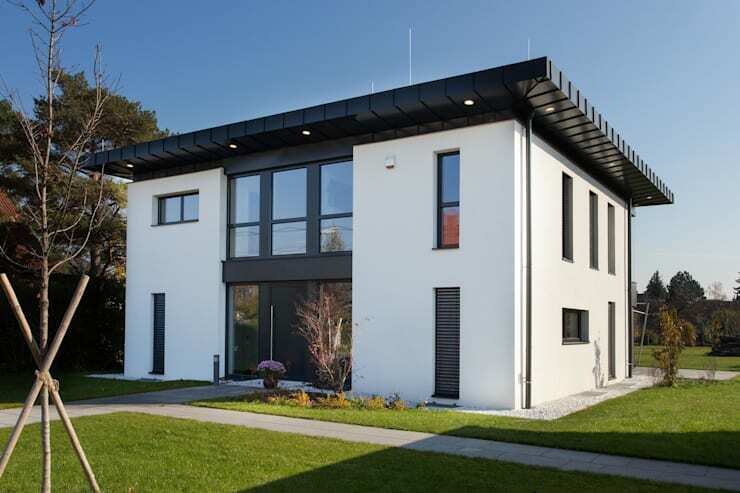 Architects Atelier Fürtner-Tonn, designed a modern dream home, which is airy and spacious, yet very cozy. Located in the 22nd district of Vienna, this home features natural colors and materials that speak with a clear design language. This family home has been carefully thought out and designed, right to the very last detail. In fact function and trend collide dramatically in this gorgeous piece of architecture. You'll never find such a comfortable family home! Pure white with clean lines dominated the facade of this home, while introducing interesting details throughout. One of these includes the fabulous black roof, which stands out dramatically and not just because of its bold colour. The shape of the roof and the strategical placement of lights throughout it result in a real eye-catcher of a home. For the windows, the architects have chosen different shapes, which mix up the look and feel of the facade. The entrance is impressive, even in the dark when the lighting illuminates every aspect of it. A stone tiled pathway leads up to a wide front door, which contrasts beautifully with the neatly manicured lawn. Above the front door is a large window, which takes up the entire facade, enhancing the height of the entrance. Next to the front door, glass windows allow us a glimpse into the home as well as the stairwell in the entrance hall. It also radiates light. 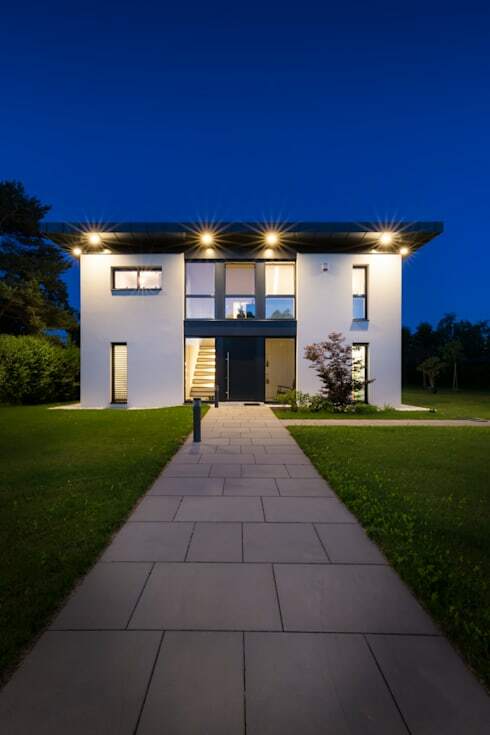 Have a look at these outdoor lighting ideas for modern houses for inspiration for your own home! The hall is dominated by the simple yet very detailed stairs. 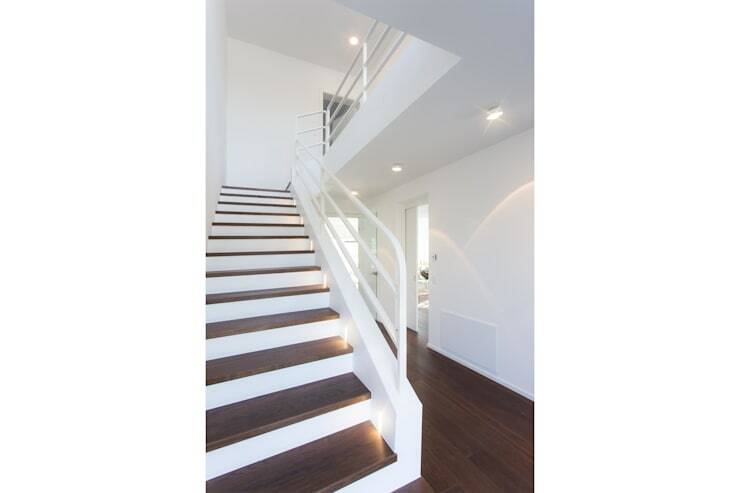 The staircase is completely white, continuing the theme that we saw used outside throughout the facade. The walls and ceiling are also white. The dark wood featured in this area packs quite a punch in contrast with the stark white tones, while sweeping across the entire floor area of the home. On the stairs, we can see see how each dark wooden step is individually illuminated with the spots of light that have been strategically installed. In the kitchen, we come across the same colour combination that we have already seen in the hall. 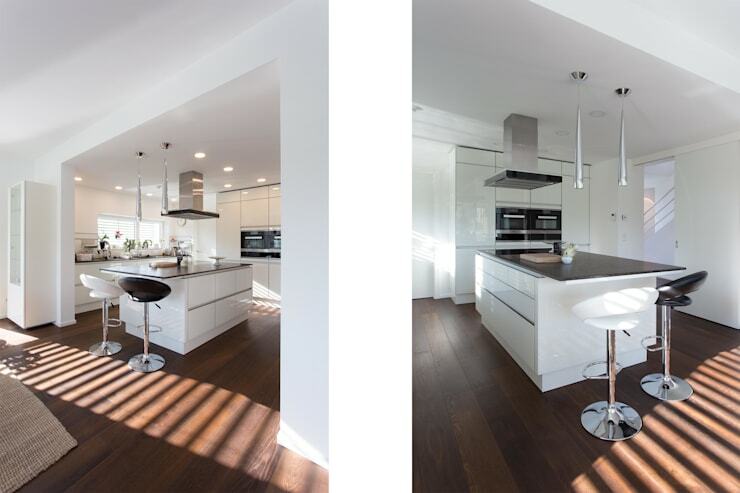 The floor is made up of dark wood, which highlights the pure white of the kitchen furniture and the walls. The look and feel is very modern and minimalist, which works thanks to the rays of sunshine that penetrate through the windows, throwing interesting shapes on the floor while warming the space up naturally. The kitchen island is also finished in all white with the bar stools bringing a touch of black to the space. Like the idea of a white kitchen? Have a look at these 10 all white kitchens for inspiration! The bathroom holds a surprise in store, in terms of the colour scheme. While in all of the other rooms, we have seen a combination of light and dark, the white tones in this room have been paired with soft natural beige and cream tones. 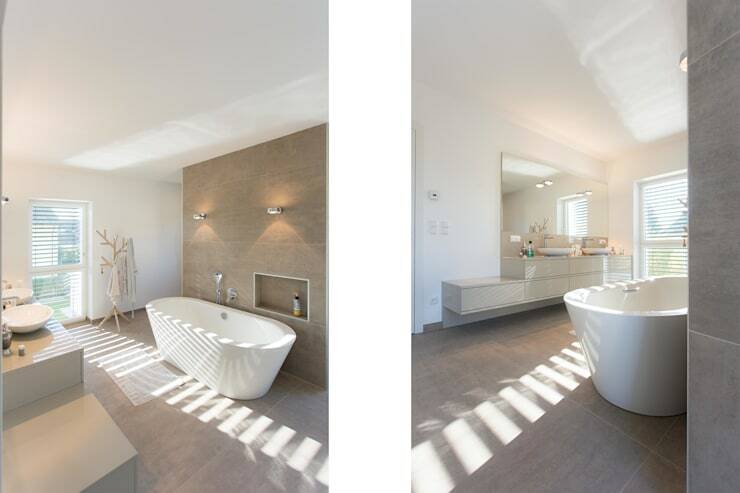 The white, freestanding bath with its stylish shape faces a wall that features long, stone tiles. There is also a shelf built into the wall, where shampoo bottles, soaps and other items can be stored neatly away while still easily accessible. The slats on the window play with the light in this room, creating a very attractive look and feel. 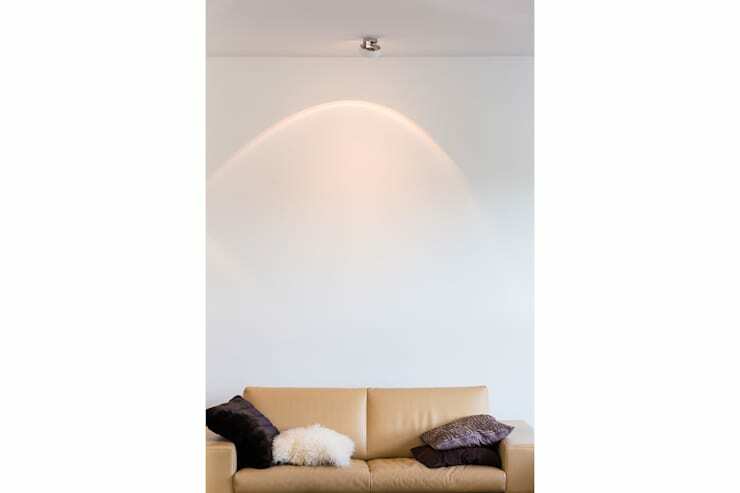 The designers have also chosen wall lights, which offer the room a soft and warm glow. The protagonist in the living room is clearly the brown leather sofa, which has been decorated with cushions in different colours and materials. A discreet light on the ceiling illuminates this special piece of furniture, like a main character acting in a theater under the spotlight. Do you like an all-white design?